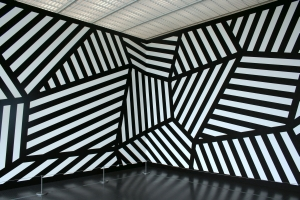 A pioneer in the development of Minimalism and Conceptual art in the 1960s and 1970s, LeWitt was born in Hartford, Connecticut to a family of Jewish immigrants from Russia. His mother took him to art classes at the Wadsworth Atheneum in Hartford. After receiving a BFA from Syracuse University in 1949, LeWitt traveled to Europe where he was exposed to Old Master painting. Shortly thereafter, he served in the Korean War, first in California, then Japan, and finally Korea. LeWitt moved to New York City in 1953 and set up a studio on the Lower East Side, in the old Ashkenazi Jewish settlement on Hester Street. During this time he studied at the School of Visual Arts while also pursuing his interest in design at Seventeen magazine, where he did paste-ups, mechanicals, and photostats. In 1955, he was a graphic designer in the office of architect I.M. Pei for a year. Around that time, LeWitt also discovered the work of the late 19th-century photographer Eadweard Muybridge, whose studies in sequence and locomotion were an early influence. These experiences, combined with an entry-level job as a night receptionist and clerk he took in 1960 at the Museum of Modern Art (MoMA) in New York, would influence LeWitt’s later work.